Exclusively from Adrian Steel: A shelving platform that allows you to put shelves where you want them, not where we think you need them! The ADseries is the next generation of cargo management solutions, engineered to optimize your work van storage and accessibility. Featuring truly ADjustable shelves, an ADaptable rail system, heavy-duty shelves and an ADvanced stamped steel end panel designed to accommodate the diverse range of cargo you need to get the job done! The ADseries is an ADrian Innovation and is backed by our industry-leading 3 year/36,000 mile warranty. The ADseries features stamped steel end panels and shelves. They are strong, durable and ready to work hard. A six inch knock out at the bottom of the end panel provides 48" of floor space to accommodate sheet goods (up to 22 sheets of 1/4" drywall or a combination of thicknesses.) 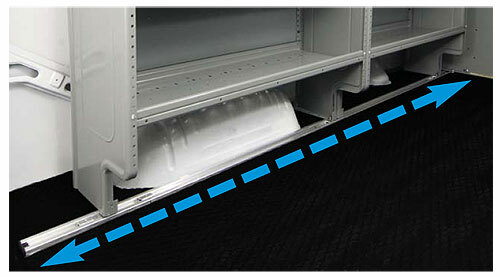 Contoured end panels provide 36" between the panels from the top to bottom maximizing aisle space. Tools, equipment and cargo come in all shapes and sizes and until now, there hasn’t been a shelving unit that is truly adjustable. The ADseries is the first of it’s kind where with only a screwdriver, you can simply remove the front shelf bolts and move the shelf where you need it. Shelves can be adjusted in one inch increments and provide the most flexible shelving solution available. The ADseries is 46" high by 14" deep and comes in lengths of 32", 44" and 50" wide. Truly Adjustable Shelves All you need is a phillips screwdriver! Simply remove two bolts from the speed nut clips that come with the shelf, tilt the shelf upwards, move the shelf to your desired location, insert the rear shelf studs, reattach the bolts and your done! Everyone likes to set their work van up their own way. The new ADseries shelving lets you position the shelving where you need it. Exclusive to the ADseries, the unique rail system enables you to reposition the shelving in the van, increasing the available space for trade specific equipment. All of this is done without removing bolts, plugging holes and redrilling the van! Businesss change over time and your van interior should be able to change with your needs. Plug and Play shelves have prepunched holes that allow adding storage solutions easily! 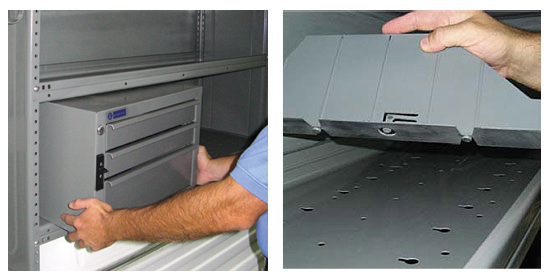 ADseries dividers simply snap in place, drawer units simply bolt in and door kits can be added to lock your more valuable parts and equipment. 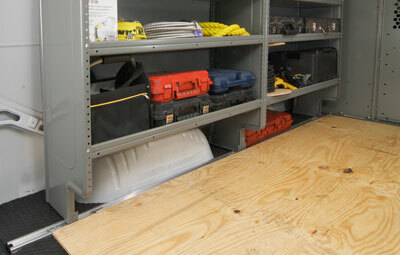 Many Adrian Steel accessories can be added to the ADseries shelving with the rail adapter kits and end panel brackets.